I am having problem finishing the Chapel chapter 4. I can’t get though the gate it keeps telling me that I have unfinished business here. Please help. I’ve had the same problem twice, Brandy. I think there’s a bug in the game. So how do you get past Ch 4 if you can’t go through the gate? I accidentally exited the game and it won’t let me get back to the same place I was in. I am trying to reach the lake and gazebo to unlock the ornate box I found after going fishing. Now I can’t do anything in the game at all. I am having the same problem. I got out of the game after putting the fishpole together and now I can’t get back to the lake. Game is glitchy like Sarah I exited the game but not accidentally the screen started flashing like a strobe light and I couldn’t shut the program off via task manager so I had to log off of my Windows profile then log back in. When I left the game I was halfway through Chapter 6: Blackwater Park, when I went back to the game I still had all my items from Blackwater Park but I was back at Limmeridge with no way (visibly) to get back to Blackwater Park. I have been trying for about a half an hour now just wandering around. I have finally given up. It’s just so frustrating because I was so close to the end. I went into the second building last night and it got quite late so I had to exit the game. I went back in the game this afternoon and I can’t get back in where Ileft off! Help!!!!!!!!!!! I just started playing the hidden objects game “Woman in White” and it was really easy until I got to the part where you need to assemble the fishing reel on the dock.I get most of the reel assembled and then I go to the garden where the water pump is. I get the water flowing in the pump. Then it states that the pump has no handle and the rest of the fishing reel is located at the foot of the water pump under the cement screen and you need an inventory items so you can reach it. My problem is in the inventory items all I have at this point is a couple stones, a fish and a hammer. Where in the world do I go from there? Neither of those items work on the pump for a handle or to reach the remaining parts of the reel. I would so appreciate any help anyone could give me as I have gotten so frustrated trying to figure this out! I am sure it is something easy I am overlooking as some of you have gotten quite far in the game. Thank you in advance. 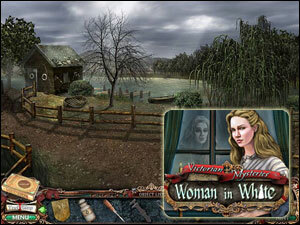 I can’t get back in chapter 5: Blackwater Park-ready for hidden object game. When I exited out it didn’t take me back to where I left off. Posted on Saturday, September 18th, 2010. Follow any responses through the RSS 2.0 feed.